Support. Construction, maintenance, utility and incident zones can all benefit from TTC to compensate for the unexpected or unusual situations faced by road users. When planning for TTC in these zones, it can be assumed that it is appropriate for road users to exercise caution. Even though road users are assumed to be using caution, special care is still needed in applying TTC techniques. Special plans preparation and coordination with transit, other highway agencies, law enforcement and other emergency units, utilities, schools and railroad companies might be needed to reduce unexpected and unusual road user operation situations. During TTC activities, commercial vehicles might need to follow a different route from passenger vehicles because of bridge, weight, clearance or geometric restrictions. Experience has shown that following the fundamental principles of EPG 616 will assist road users and help protect workers in the vicinity of TTC zones. Guidance. Road user and worker safety and accessibility in TTC zones should be an integral and high-priority element of every project from planning through design and construction. Similarly, maintenance and utility work should be planned and conducted with the safety and accessibility of all motorists, bicyclists, pedestrians (including those with disabilities), and workers being considered at all times. If the TTC zone includes a grade crossing, early coordination with the railroad company or light rail transit agency should take place. Support. Formulating specific plans for TTC at traffic incidents is difficult because of the variety of situations that can arise. A. The basic safety principles governing the design of permanent roadways and roadsides should also govern the design of TTC zones. The goal should be to route road users through such zones using roadway geometrics, roadside features, and TTC devices as nearly as possible comparable to those for normal highway situations. B. A TTC plan, in detail appropriate to the complexity of the work project or incident, should be prepared and understood by all responsible parties before the site is occupied. Any changes in the TTC plan should be approved by an official who is knowledgeable (for example, trained and/or certified) in proper TTC practices. A.	TTC at work and incident sites should be designed on the assumption that drivers will only reduce their speeds if they clearly perceive a need to do so (see EPG 616.3.1). B. Frequent and abrupt changes in geometrics such as lane narrowing, dropped lanes or main roadway transitions that require rapid maneuvers, should be avoided. C.	Work should be scheduled in a manner that minimizes the need for lane closures or alternate routes, while still getting the work completed quickly and the lanes or roadway open to traffic as soon as possible. D.	Attempts should be made to reduce the volume of traffic using the roadway or freeway to match the restricted capacity conditions. Road users should be encouraged to use alternative routes. For high-volume roadways and freeways, the closure of selected entrance ramps or other access points and the use of signed diversion routes should be evaluated. E.	Bicyclists and pedestrians, including those with disabilities, should be provided with access and reasonably safe passage through the TTC zone. F.	If work operations permit, lane closures on high-volume streets and highways should be scheduled during off-peak hours. 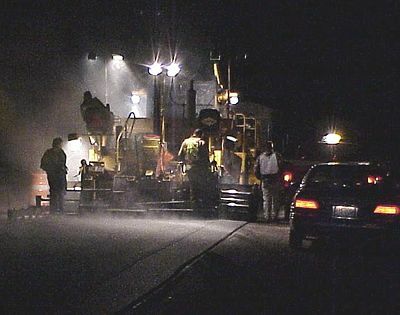 Night work should be considered if the work can be accomplished with a series of short-term operations. G.	Early coordination with officials having jurisdiction over the affected cross streets and providing emergency services should occur if significant impacts to roadway operations are anticipated. A. Adequate warning, delineation, and channelization should be provided to assist in guiding road users in advance of and through the TTC zone or incident site by using proper pavement marking, signing, or other devices that are effective under varying conditions. Providing information that is in usable formats by pedestrians with visual disabilities should also be considered. B.	TTC devices inconsistent with intended travel paths through TTC zones should be removed or covered. However, in intermediate-term stationary, short-term, and mobile operations, where visible permanent devices are inconsistent with intended travel paths, devices that highlight or emphasize the appropriate path should be used. Providing traffic control devices that are accessible to and usable by pedestrians with disabilities should be considered. C.	Flagging procedures, when used, should provide positive guidance to road users traversing the TTC zone. A. Individuals who are knowledgeable (for example, trained and/or certified) in the principles of proper TTC should be assigned responsibility for safety in TTC zones. The most important duty of these individuals should be to check that all TTC devices of the project are consistent with the TTC plan and are effective for motorists, bicyclists, pedestrians, and workers. B. As the work progresses, temporary traffic controls and/or working conditions should be modified, if appropriate, in order to provide mobility and positive guidance to the road user and to provide worker safety. The individual responsible for TTC should have the authority to halt work until applicable or remedial safety measures are taken. C.	TTC zones should be carefully monitored under varying conditions of road user volumes, light, and weather to check that applicable TTC devices are effective, clearly visible, clean, and in compliance with the TTC plan. D.	When warranted, an engineering study should be made (in cooperation with law enforcement officials) of reported crashes occurring within the TTC zone. Crash records in TTC zones should be monitored to identify the need for changes in the TTC zone. A. To accommodate run-off-the-road incidents, disabled vehicles, or emergency situations, unencumbered roadside recovery areas or clear zones should be provided where practical. B.	Channelization of road users should be accomplished by the use of pavement markings, signing, and crashworthy, detectable channelizing devices. C.	Work equipment, workers’ private vehicles, materials, and debris should be stored in such a manner to reduce the probability of being impacted by run-off-the-road vehicles. 6. Each person whose actions affect TTC zone safety, from the upper-level management through the field workers, should receive training appropriate to the job decisions each individual is required to make. Only those individuals who are trained in proper TTC practices and have a basic understanding of the principles (established by applicable standards and guidelines, including those of this article) should supervise the selection, placement, and maintenance of TTC devices used for TTC zones and for incident management. A. The needs of all road users should be assessed so that appropriate advance notice is given and clearly defined alternative paths are provided. B. The cooperation of the various news media should be sought in publicizing the existence of and reasons for TTC zones because news releases can assist in keeping the road users well informed. C.	The needs of abutting property owners, residents, and businesses should be assessed and appropriate accommodations made. D.	The needs of emergency service providers (law enforcement, fire and medical) should be assessed and appropriate coordination and accommodations made. E.	The needs of railroads and transit should be assessed and appropriate coordination and accommodations made. F.	The needs of operators of commercial vehicles such as buses and large trucks should be assessed and appropriate accommodations made. Standard. Before any new detour or temporary route is opened to traffic, all necessary signs shall be in place. All TTC devices shall be removed as soon as practical when they are no longer needed. When work is suspended for short periods of time, TTC devices that are no longer appropriate shall be removed or covered. For additional information, refer to EPG 616.3 Temporary Traffic Control Elements and EPG 616.16 Law Enforcement Services . This page was last modified on 7 April 2017, at 13:45.